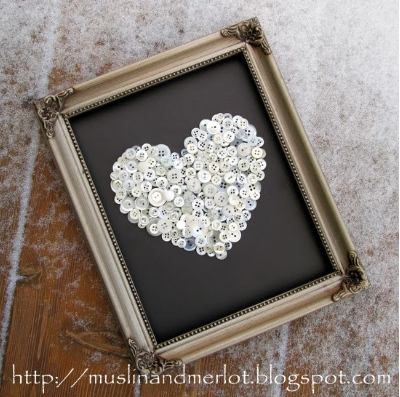 Since Valentines Day is fast approaching I thought I would share some of my favorite Heart Crafts to make and display for Valentines Day and beyond. 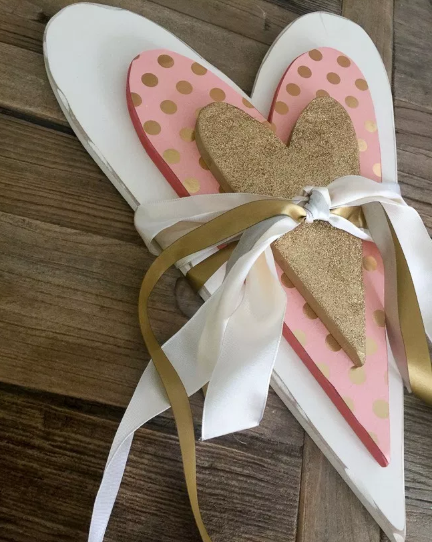 You don’t have to wait until Valentines day to make these cute hearts or display them but Valentines Day will give you a good excuse. (Sorry this is a few days late, it’s been a busy week and now I’m out of town). I love these embellished layered wood hearts by Tatertots and Jello. They would be sweet in a nursery also. 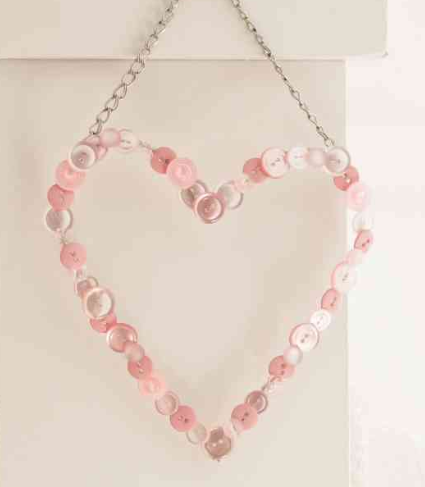 This sweet button heart keepsake by Tidbits could be made for any special occasion. 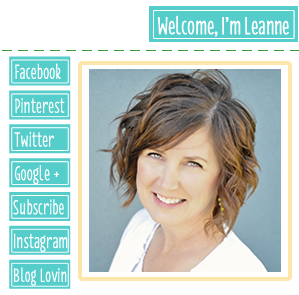 You could use new buttons or use your button collection to make it even more special. Who doesn’t love pom poms? 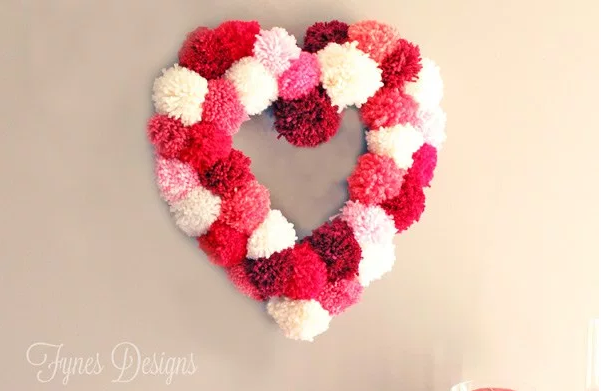 Fynes Designs shows you how to make this fluffy heart wreath. I love the variegated colors! Design Improvised made a whole wall of hearts on canvas. 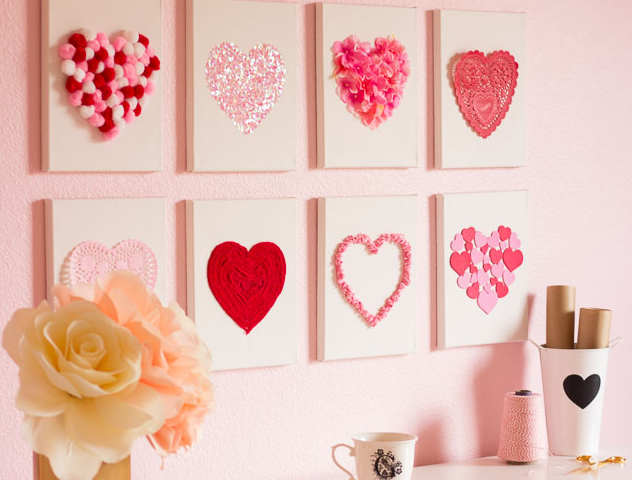 I love how you can dedicate a whole space to Valentines Day or change the colors a little and display them year round. 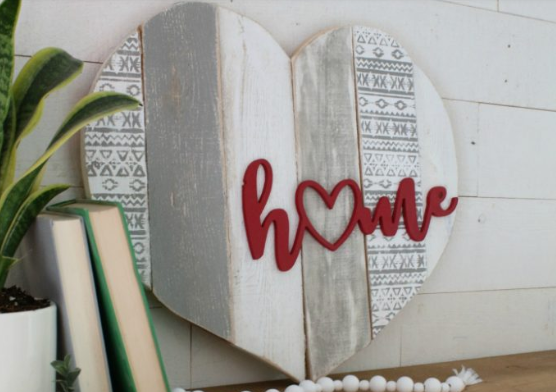 This stenciled heart with a home cutout can easily be displayed year round to show just how much home means to you. The stencil adds a special touch. 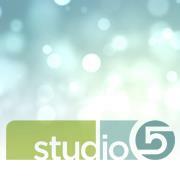 You can check it out at Lolly Jane. I love chalkboards and being able to write special messages to family members. 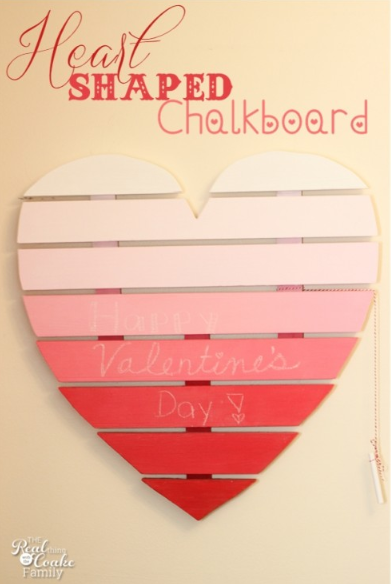 The Real Thing with the Coake Family shares how to make this pallet heart chalkboard. It would be so cute to make in different shapes too. 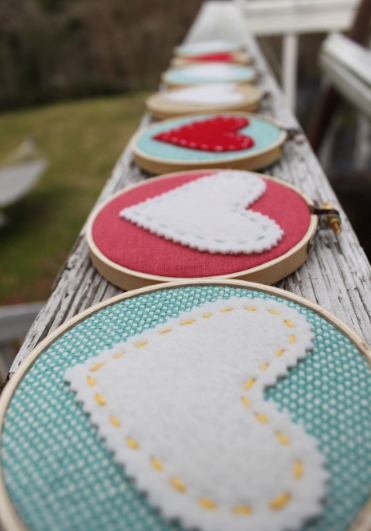 I’ve been meaning to make simple felt hearts stitched on hoops for a while now. Lauren Makes beat me to it but I think I still might be making some soon. They’re just too adorable. 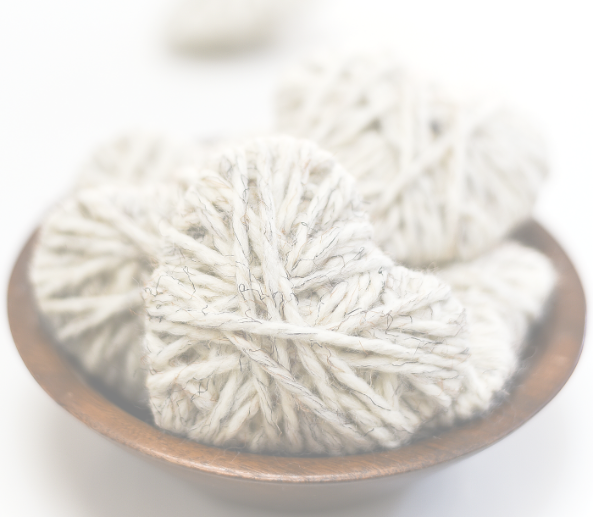 These yarn wrapped hearts in a wood bowl are so simple and pretty. I would definitely leave them displayed year round. 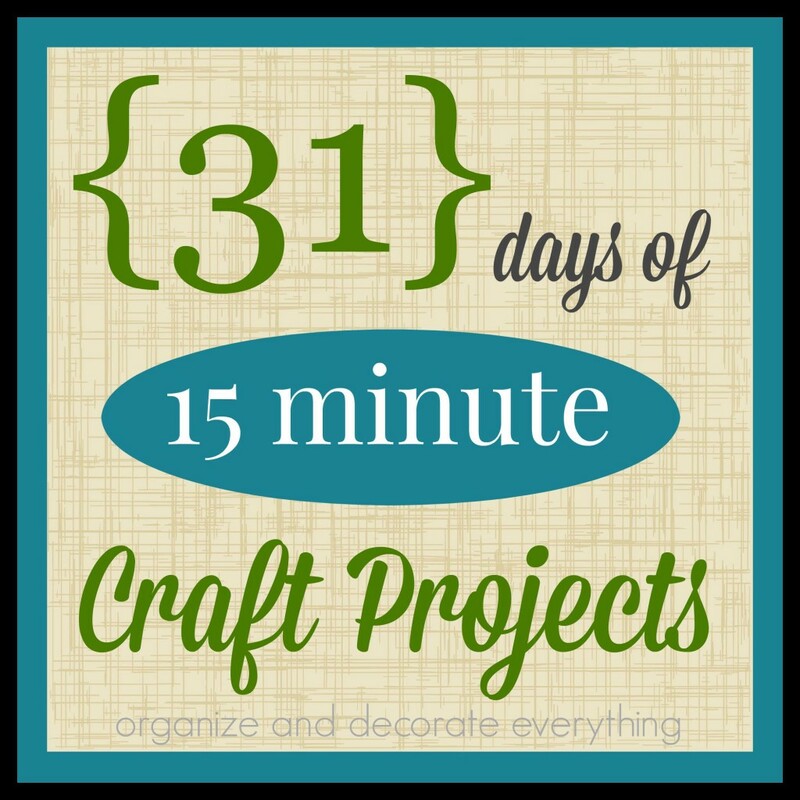 It All Started With Paint shares how easy they are to make. Seasonal pillows are a must have in my house. 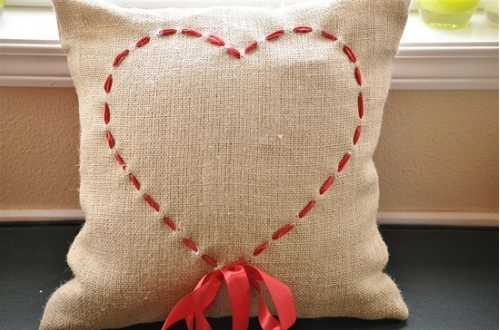 This heart pillow by Your Homebased Mom is so simple but it makes such a great statement. I might need a few. 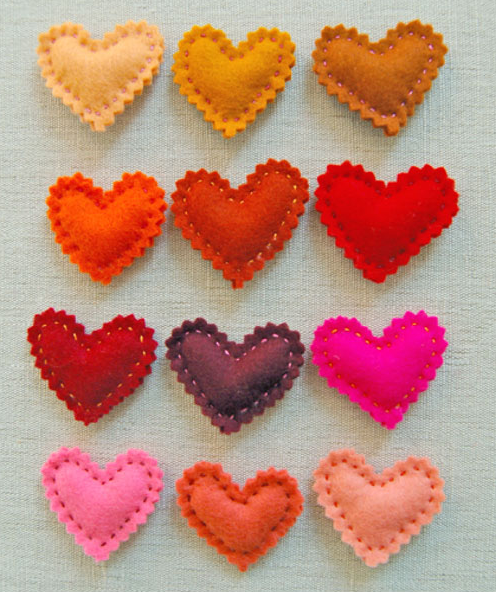 I just want to make dozens of these sweet little felt hearts and display them all over my house. Twig and Thistle shares how easy they are to make. 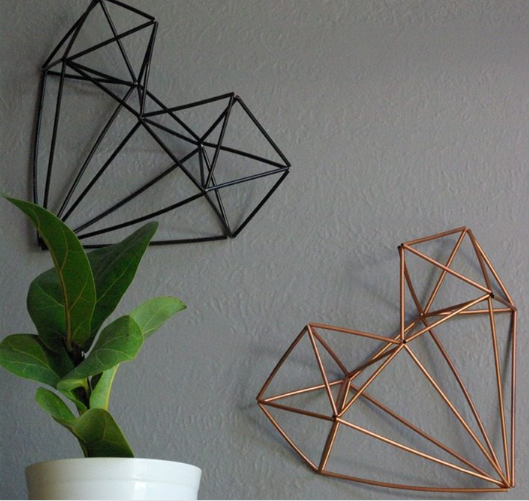 If you want a little different look that can definitely be displayed all year then these geometric hearts are for you. Learn how to make them at Vintage Revivals. 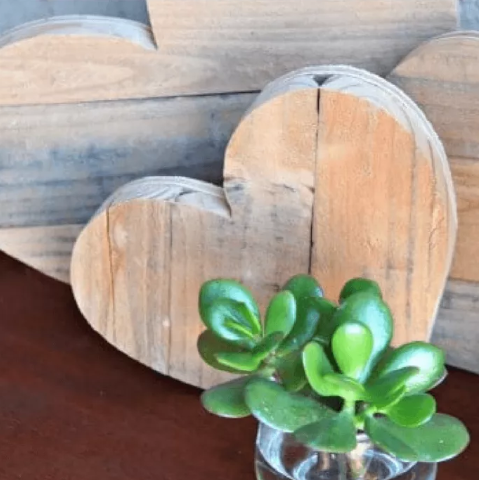 I’m ready to pull out my saw and create a few of these pallet wood hearts. Since you use pallet wood they’re basically free. 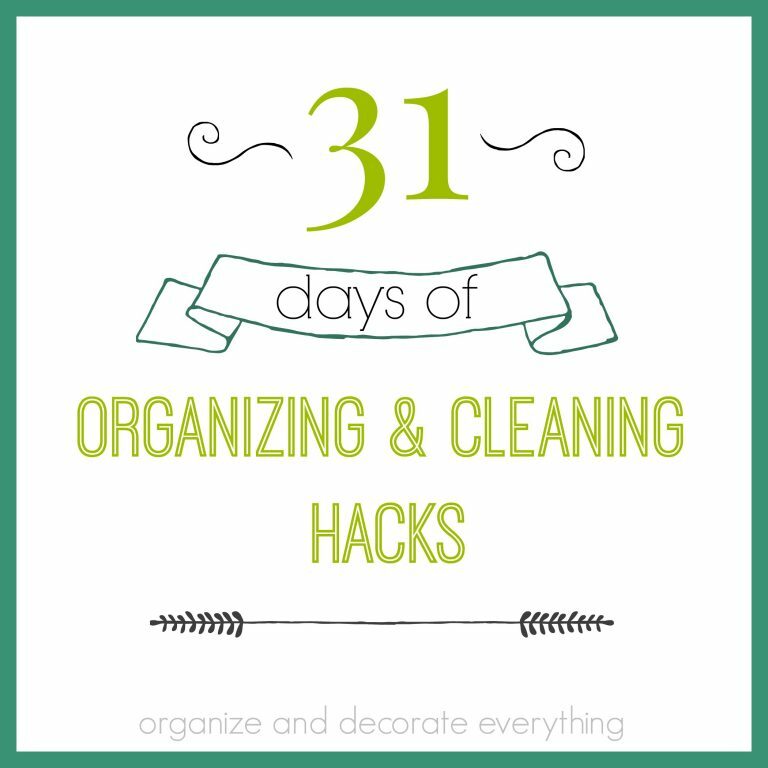 You can leave them natural, stain, or paint them. Pennies into Pearls shows you hoe to make them. I have a thing for maps so I always have some ready for craft projects. 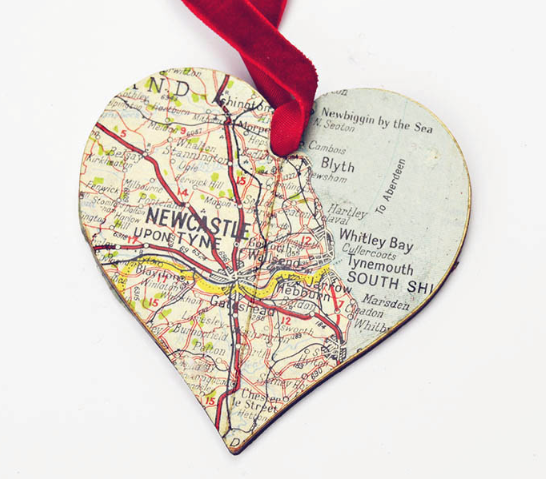 Pillar Box Blue made these ornaments that are perfect for Valentines Day or Christmas. Pick your favorite places to visit or destinations special to your family. I made a Button Heart similar to this last week. 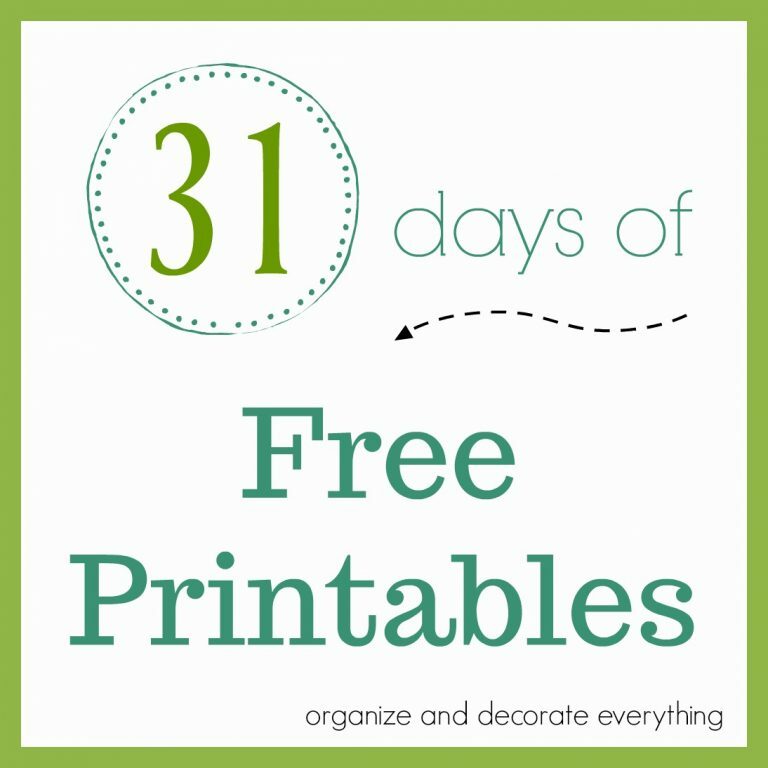 I hadn’t seen this one yet but I love how it can easily be displayed year round and in any room. It’s just beautiful and made by Muslin and Merlot. 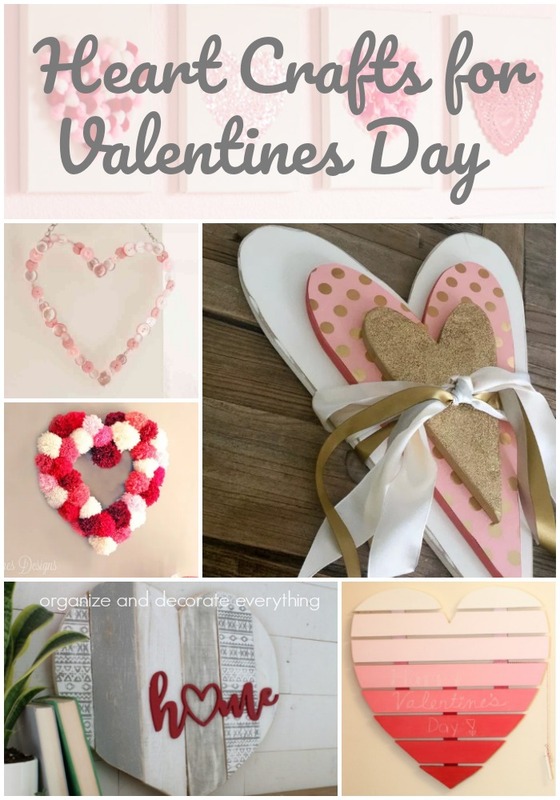 Enjoy these heart craft ideas and create your favorites. I did a cute button craft a couple of years ago – would love to make something else new – thanks for the ideas!